George Boyd’s 61st minute winner earned the Clarets a sensational victory over defending champions Manchester City. The midfielder’s fifth goal of the season, and second against City, bolstered Burnley’s survival hopes significantly while severely denting the away side’s chances of retaining their Premier League crown. The win, Burnley’s first in nine in all competitions, moved them to within a point of Sunderland after Gus Poyet’s side were beaten 4-0 at home to Aston Villa. Manchester City midfielder Frank Lampard alluded to the desire and work-rate of the Clarets in a pre-match interview. “Their desire is second to none,” he said, prior to the Saturday evening clash at Turf Moor. “We’ve all heard the stories about them running more miles than anyone else this season during games,” the 36-year-old went on. 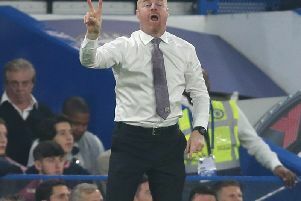 Chelsea’s all-time leading scorer cited that he had the utmost respect for the Clarets and boss Sean Dyche, who worked with Lampard Snr during his tenure at Watford. And that outlook will only have been enhanced as Lampard watched from the sidelines as his team-mates grew frustrated against their prodigious opposition. It was the home side’s 37-year-old defender Michael Duff that typified that character and mentality. In a week where the one-time Northern Ireland international announced details of his testimonial, Dyche opted to hand the club’s £30,000 signing his first league start since victory over Stoke City at the Britannia Stadium in November. Striker Sam Vokes, just short of a year since his last league start, completed the changes to Dyche’s starting XI, the first time he’d tinkered with his line-up in five games. Michael Keane and Michael Kightly dropped to the bench. Emmanuel Adebayor, Craig Bellamy and Carlos Tevez had all netted within seven minutes the last time the two sides met at Turf Moor five years ago. But there was no threat of that this time as Burnley’s two banks, enhanced by Danny Ings and Vokes up top, worked with exceptional synchronism to restrict the space and passing streams for City to work in. Ings had the first attempt at goal when his own improvisation and control manufactured the space but the finish ended with the thousands of City fans behind Joe Hart. The first moment of controversy arrived moments later, but it was the first of many that resulted from a disturbingly inept display from referee Andre Marriner. The match official ignored appeals when Kieran Trippier’s centre seemingly struck the arm of full back Gael Clichy. And as the hosts continued to take the game to the current Premier League champions, Ben Mee headed over at the back post after Ashley Barnes had flicked Trippier’s corner on. Barnes was next to try his luck, once Boyd capitalised on Hart’s poor clearance, but his effort flicked off the boot of Pablo Zabaleta and looped over the bar. Edin Dzeko missed the target after Hart’s clearance aided Jesus Navas’s break before the striker was foiled by the legs of Tom Heaton at his near post following Fernandinho’s incisive pass. Sergio Aguero was denied by Heaton from the follow up. Hart plunged to his left to save Scott Arfield’s strike after great work from Barnes down the left hand side while Aguero hammered wide of the upright as the half came to a close once Jason Shackell blocked Dzeko’s attempt. The Clarets hadn’t registered a clean sheet in 15 outings, but you sensed that could change once Heaton denied David Silva and Aguero smashed wide of the near post from Zabaleta’s assist. Boyd had Hart floating to his right hand upright with a beautifully sweeping volley that flashed just wide, but he saved his best until just after the hour mark. The 29-year-old sent Turf Moor in to raptures when arrowing Vincent Kompany’s headed clearance in to the far corner with his left foot following Trippier’s set-piece, a result of Clichy upending Ings. Boyd’s fifth of the campaign ensured he became the only player in the Premier League to find the net against City in both games this term. But the biggest test was yet to come - hanging on to the lead having slipped against Crystal Palace and West Brom on home soil. Aguero flicked a header around the post from Yaya Toure’s delivery as the visitors pressed for an equaliser while Shackell stuck a boot out to prevent the Ivorian’s stinging drive from finding the corner minutes later. Toure and Aguero linked up in a bid to level proceedings, but the latter surprisingly missed the target with a header from the angle of the six yard box after peeling away from his marker. Substitute Stevan Jovetic went close as the tension rose, but he bent an effort around the post after moving the ball out of his feet. There was still time for some late drama and contention, though. As Zabaleta broke in to the box, shaping the ball on to his weaker foot, Mee went to ground and sent the full back tumbling. The stadium waited with baited breath for Marriner’s decision. Replays showed it was a stone wall penalty. But remarkably he awarded a free-kick to the home side. It was a poor decision, but Dyche’s men deserved their break however controversial it was.